Gibson guitars has named the top 10 metal axe men of all time. 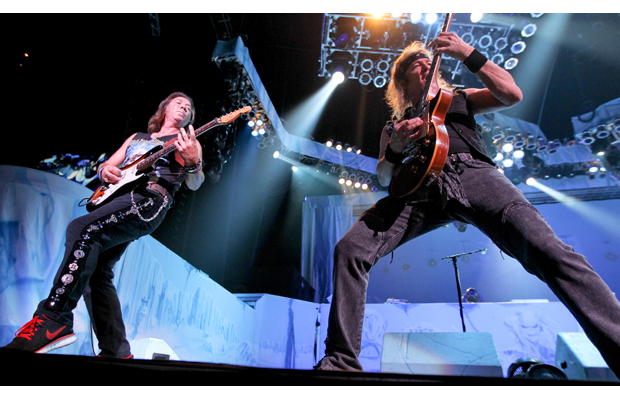 Iron Maiden guitarists Dave Murray and Adrian Smith are featured in the survey. See the whole list here. Says Gibson: Of all rock’n’roll’s many styles metal is the most brutal. No matter the sub-genre, metal is held together by a reliance on loud riffing guitars and, of course, an inspiring lead guitarist. Editorial note: Congrats to Tony Iommi, but Kirk Hammet at the no 2 spot? Seriously… Go Dave and Adrian! ← New solo albums from Bruce and Steve? Personally I would include Alex Skolnick and Dave Mustaine on the list. Kirk, sadly, shouldn’t even be in the top 50.